Please respond to this email. I contacted you about 2 weeks ago and did not get a response. When a client submits my Toxicity Questionnaire form, if there is a 0 in the total box the form will not be submitted. A 0 is a valid number for my form and needs to be accepted. Please tell me how I can fix this problem. We do reply to each message, so it is most probably that we did not receive your previous inquiry. We are sorry for this. 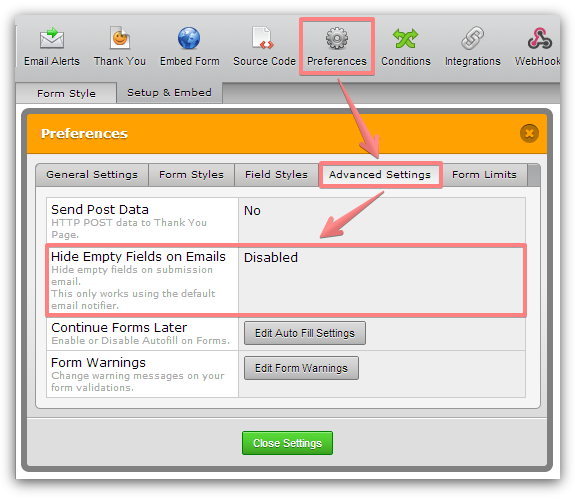 According to my tests, the issue is related to enabled 'Hide Empty Fields on Emails' option on your form. For some reason, it is conflicting with the 0 values on required text boxes. I have submitted a bug report ticket about this issue, and once we have any updates on this, we will let you know. In the meantime, you can disable mentioned option. know when the bug is fixed, as I would like to enable that feature. Do you mean to upload a new form to your webpage? If so, then the answer is no. You do not need to upload or update your form in your webpage as you are simply using the URL of the standalone version of your form(s), so it will automatically reflect the changes. We will inform you via this thread once the issue is resolved. We have fixed the bug. Please check your form and let us know if the problem persists. If you have other questions or concerns, please do let us know as well. Thank you for reporting this matter to us.